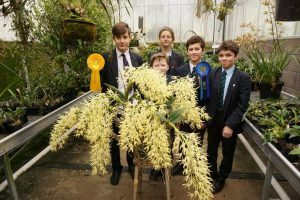 Here is the team from Cool Asia with the Dendrobium speciosum which won best in class and best in show at the South West Orchid Society’s annual show. It was perfect timing that the flowers were all open and really fresh for the show as they’ll begin to go over next week. Overall the team were thrilled to win these awards and are looking forward to the other specimen plants in the section flowering.